Cybex have thought of a lot of details that both users and owners appreciate. Multi-position design of handle bars accommodates riding styles from upright to aero with two sets of contact heart rate grips so HR can be monitored in any position. The optional Personal Entertainment Monitor with iPod compatibility turns itself off to save energy and prolong monitor life. 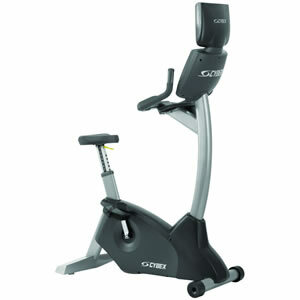 And … the CYBEX bike has wheels in the front – so it can be moved around whenever the floor design is changed. For low maintenance. With a welded frame made from forged steel, the CYBEX 750 bikes have a three piece heavy duty mountain bike crank that makes them durable enough for rugged mountain terrain. In a gym setting, this construction translates to low low maintenance. And … CYBEX engineers even designed the enclosures so that sweat is directed away from the bike mechanism.